As we see elsewhere, the threat of new technologies or services is sometimes met head-on in Spain. The taxi drivers and the hoteliers both angry with their new competitors Uber and Airbnb, and both able to do something about it (by which we mean, talk to the legislators). Another business that is fearful of new forms of competition is the daily newspaper. This, again, thanks to technology. Why read one source (for a euro fifty), with much bulk that is inevitably left unread anyway, when you can read as many sources as you want, of things that interest you, on your computer or Smartphone, for free? Along comes at least two major tactics from the ‘dailies’ (who are, of course, themselves large corporations). First we have the attempt to close down – or at least wound – those smaller news providers who use links in the reports (you can’t use links in the printed media, rather obviously). The Spanish ‘dailies’, joined together into the AEDE – the Asociación de Editores de Diarios Españoles – has leaned on their friends in the Government to impose the notorious ‘Google Tax’, whose only victim so far has been Google News, an aggregator which sends readers to the original source! For the moment, this measure against other sites has been bounced by the Supreme Court, but the AEDE is keen to try again, as they don’t want the competitors drawing ever-more readers away. But, what of ‘Fake News’? Here is The Telegraph: ‘Fake news was not a term many people used 18 months ago, but it is now seen as one of the greatest threats to democracy, free debate and the Western order’. Gracious! One should move to ban this terrible menace – maybe by creating laws! An enthusiastic initiative to do precisely this comes from the PSOE as reported in El País: ‘Spanish Socialists propose measures to curb online fake news’. It is said that the Brexit vote, or Trump’s victory or the Independence movement in Catalonia, were all aided by fake news from Russia. Others say that on the contrary this is merely another cynical example of fake news, or better still, ‘disinformation’. The Catalonian story of endless lies and provocations provided by fiendish Russian bots was investigated by a group called Transparency Toolkit and printed in a British parliamentary report which concluded that some of the items reported by the Spanish constitutionalist press were themselves planted by El País and others. The report on fake news says: ‘...In some cases, there may be a temptation to use groundless allegations of fake news to support political arguments. Disinformation is not a technique unique to Russia, Venezuela, or any one country or group. It is necessary to explore how claims of fake news can themselves be used as a manipulative tactic and understand the impact this has on society’. The Spanish national TV may also be guilty of improper manipulation, as the RTVE is investigated in the European Parliament this week, looking to see if ‘...the principles of objectivity, plurality and impartiality are observed’ in their news services as they must be under European law. Fake News (we ignore joke news sites like El Jueves and El Mundo Today) may turn out to be little more than a Trojan horse, used to silence other news-sites, allowing for the resurgence of the traditional news-services – the daily newspapers, the major radio and TV channels. After all, corporations do not like competition. VozPópuli finds five reasons why we are on the way to a new housing bubble: ‘major demand in the larger cities, higher rental demand, interest from the vulture funds, the legacy of the past crisis and the willingness of the banks to hand out mortgages once again’. An article at Spanish Property Insight broadly agrees: ‘Insanity: doing the same thing over and over again and expecting different results’. ‘The definitive figures published by Spain's property registrars related to 2017 – including 9,000 homes sold to Britons – demonstrate once again the importance of non-Spanish buyers to the recent increase in sales activity in this country, and provide interesting insights into the habits of British purchasers both in the country as a whole and in the region of Murcia in particular...’. From Murcia Today here. ‘Marbella, Estepona and Benahavís are officially among the hottest and ‘most mature’ markets in Spain. The three towns saw sales shoot up by 11.15% in 2017 compared to the year before, exceeding pre-2007 levels by 10.4%. The rest of Spain, meanwhile, still lags 21% behind pre-financial crisis levels...’. From The Olive Press here. From Business Insider, the 25 fastest growing cities in Spain. Number Seven is our old friend Benalmádena (a population increase from 27,147 to 68,859 in twenty years), Nº 10 is Alhorín de la Torre (16,914 to 39,153), Nº 13 is Mijas (35,423 to 77,151)... but the fastest of them all, with the largest population growth in the past 20 years – a growth of 975%, is the town of Arroyomolinos, to the south of Madrid, with an increase from 2,709 to 29,128. The PSOE for Málaga say that 87 provincial villages and small towns have lost 30% of their population in the past five years. No doubt threatening to demolish houses hasn’t helped. The report is at La Opinión de Málaga here. From El Mundo here: ‘Expelling los okupas, the squatters, from a private home in a matter of days as opposed to taking months or even years. This is the objective of the modification of the Civil Procedure Law that has been approved by the Justice Commission of Congress with the aim of guaranteeing the right to property of individuals and public administrations. According to new rule going through Parliament, the dwellings belonging to individuals, social entities and those of public administrations will be beneficiaries of this new eviction procedure requesting "the immediate recovery of full possession of a dwelling or part of it, provided that they have been deprived of it without its consent"...’. A Place in the Sun looks at ‘Moving to Spain during Brexit’. The number of foreigners living in the Balearics has fallen by 23% in the last six years, says El Mundo, quoting the INE figures culled from the padrón. Chapter and verse here. The number of Britons registered as living in Spain (padrón figures at the INE) has actually risen in the past twelve months by over 4,000. The official figures have gone from 236,669 to 240,934 as of January 1st 2018. Other nationalities are here. The town hall of Palma is prohibiting tourist rentals in apartment buildings. Bolsamanía has the story here. In English here. Wealthy chalet-owners are not affected (here). Nueva Tribuna talks to the Plataforma Contra los Fondos Buitre (here): ‘The vulture funds have landed in Spain on a massive scale, buying homes like crazy. Empty houses, evicted families, abusive rental prices, the double occupancy of tourist flats. What is happening with housing in Spain?’ Greed. From El Mundo: ‘Hoteliers demand from the Government legal protection against Airbnb and similar home-rental companies, along the lines of a similar service given to the taxis against Uber’. It’s lucky the Post Office is publicly owned, or they would be campaigning against Gmail. ‘Around 500 people demonstrated last Friday in Ibiza against overcrowding and luxury tourism. A total of 37 platforms have joined the protest called by the association Prou! (Enough! ), which for years has been calling for effective measures to improve the coexistence between tourists and residents...’. Story at Preferente here. A new con: the well-dressed man at the airport that hasn’t quite enough money for his ticket home. Look, he’s even got bags with him! Story at El Confidencial here. According to the IMF, Spaniards are now marginally wealthier than Italians. 7 Días has the story here. Spain’s Public Works Minister, Íñigo de la Serna, said the ministry will launch “before the summer” a record 2,717 million euros investment programme for the AVE high-speed train and roads...’. The Corner has more. It’s all over. Cristina Cifuentes had said that she would continue in her post until the end ‘whether a week or a year’ and that she was ‘not under investigation or accusation’. The story from El Huff Post here. Furthermore, her court case against El Diario for ‘damaging her reputation by making assertions which are based solely on assumptions and false manipulations of reality' (for the moment) goes ahead. El Diario ran a piece on Wednesday that says: ‘No Cifuentes, we won’t retract’. El Mundo Global noted that a survey suggests that 83% of Spaniards think Cifuentes should resign immediately and that her continued presence was beginning to hurt the Partido Popular. Then, a video from OKDiario showing her shoplifting some creams in Vallecas in 2011 suddenly appeared on Wednesday morning (here) and indeed, yes, she’s quit her post as president of the Region of Madrid (El País, here). In the end, two small cyber-media outlets brought her down – the left-wing El Diario and the right-wing OKDiario. One must ask how long OKDiario had this shameful video, or perhaps a better question: who gave it to them...? Pablo Iglesias has a theory. After an abstention from an ‘independent’ (an ex-Podemos councillor), the Town Hall of Alicante has fallen in a motion of censure from the PSOE to the PP. The new mayor is Luis Barcala. El Mundo reports here. The PP is looking at a proposal to have the ‘most voted’ party to rule, and avoid coalitions of smaller groups. Público has the story here. From El País in English: ‘Moncloa Confidential: A peek inside the Spanish PM’s seat of power. Spain’s epicentre of influence lies just five minutes from Madrid. With the sole purpose of supporting the country’s leader, this miniature city is accessible to only a few. Here is how it works’. El País in English must have read last week’s BoT opinion piece. ‘A vacuum on Spain’s political left. Centre-right group Ciudadanos cannot be the only alternative to the governing Popular Party. Ideas are needed from the Socialists and Podemos’. Here. From Expatica: ‘An international conference to support the peace process in the Basque region is to be held in France in early May as the separatist group ETA prepares to disband. The meeting in Cambo-les-Bains in southwest France will take place on May 4 around the same time as ETA is expected to make a historic declaration that it is ending its fight in the Basque Country that straddles the border between Spain and France...’. ‘...People say that Spain is still a democracy. Er … okay, I’d agree with that … but the image of Spain internationally, the ‘Brand Spain’ or Marca España, is piss-poor right now. And for many reasons: from the images broadcast around the world of Spanish police brutality against innocent Catalan voters last October, to the Amnesty, UN and Human Rights Watch reports about the suppression of freedom of expression in Spain, right up to the current and on-going farce of the European Arrest Warrents based upon non-existent ‘rebellion’ charges...’. Tim Parfitt on the confiscation of yellow tee shirts at the football match here. The Catalonian half of the duet Alfred y Amaia, Spain’s hopefuls for the Eurovision song Contest, gave his partner a book for San Jorge (an excellent Catalonian tradition), the book however, turned out to be called ‘España de Mierda’. Nice call Dumbass! Jordi Sànchez, the presumptive president of Catalonia – if he can only get out of ‘preventative custody’ – is currently enjoying 18 hours a day ‘lock-down’ for having sent out (smuggled out) a recorded political message during the Catalonian elections of last December. The story at Europa Press here. The petition: ‘Introduce MPs to represent the interests of British citizens living abroad. There are over five million British citizens living abroad. Their only recourse for representation in the UK is through their 'constituency' MP’. Here. From The Migration Policy Institute: ‘Next Steps: Implementing a Brexit Deal for UK Citizens Living in the EU-27’. ‘This report by MPI Europe and Goldsmiths, University of London assesses the progress that has been made in rapidly evolving EU-UK negotiations, then turns to examine the challenges national and local governments across the European Union are likely to face in implementing a Brexit deal on citizens’ rights. It draws on interviews with Member State officials to explore what planning—if any—is already underway, and on interviews with British residents of the EU-27, many of whom have been unsettled by the negotiations and received limited or conflicting advice from authorities...’. From ECREU (website): ‘The link below will take you to a very short on-line survey which has been prepared to help our coalition, British in Europe, strengthen its arguments for protecting your rights to Freedom of Movement after Brexit. You will already know that these rights stand to be restricted after the end of the transition period (31 December 2020) putting at risk the livelihoods of anyone working cross border and potentially limiting movement around Europe for us all’. Here. Some notes from Lenox. And what about our 'residencias'? Our passport / community card combo will no longer be legal since we will no longer be 'comunitarios'. We will need to obtain a 'Tarjeta de Residencia no Comunitario' (My late American wife had one). I wonder - will we have to go to the Spanish embassy in London, and will there be a queue? Once again, el Ministerio del Interior se queda callado. From The Financial Times: ‘Can Europe Process the British Expatriates?’ The article says ‘...The unease over the readiness of the EU27 on this issue is underscored by a report by the Migration Policy Institute Europe and Goldsmiths university. It says the UK has carefully spelt out what future systems for EU nationals in Britain will look like. But EU27 governments have not thoroughly thought through and made public a plan for a citizens’ rights deal in their respective countries. As a result, they risk “making a mess” of the citizens’ rights agreement. According to the report, the lack of clarity could particularly affect the rights of some groups to live and work in Europe...’. More here. In the last issue, we looked at the price index for property prices in Spain and found that it appears to have been gradually rising recently. This index, however, is general and there are a few discrepancies to be found. Some places are contributing to the rise in this index. For instance, Madrid has seen an annual increase of 17%. Palma de Mallorca also has seen a large rise of 14.7%. Barcelona also rose quite significantly. However, 23 capitals have seen their prices decrease in the last year. Thus, the picture, while showing positive signs, remains quite mixed. And while the average property in Spain has increased by 7.3% since its low point during the crisis, it remains 37.2% less than at the peak of the boom in 2007. This index, by Tinsa, which looks much like the price per square metre, is nudging upwards, but it remains to be seen how much it will continue. Certainly, some areas have shown rises, such as Madrid, Barcelona and the Baleares, though it looks up to now that there has been some bargain hunting going on, with the very low prices luring speculation. Once that is absorbed, one has to see if the incremental rise will be sustained. Moreover, many areas have not shown any rise. And if the major cities have shown some increase, the smaller ones are pretty much stagnant. It looks very much, therefore, that although there is some movement in some areas due to the low prices, we are just, if at all, getting out of the period of consolidation. Here’s a fake news story. A genuine fake one. Público reports on ‘...the hoax about Pablo Iglesias that has been spread by various media (and the Popular Party)’. Pablo is recorded by a hidden mike recommending Molotov cocktails against the Guardia Civil. Not true. The dominance of the leading broadcaster the SER is under threat from its two rivals, Onda Cero and La COPE, says El Confidencial here. Spain’s driest reservoir, where ‘it never rains’, is in Murcia. El Mundo reports here. ‘Solar power will be the most dominant form of energy in Spain by 2030. That’s according to a report by the country’s Industry Ministry, which has predicted savings of around €9,600 million on the current trajectory of renewable energy growth. The move to solar will also cut CO2 emissions by more than half while extra revenue will come from selling energy to France...’. From The Olive Press here. The problem of the overexploitation of the Río Aguas, where ecologists report that 300% more water is extracted than allowed, had reached the Andalusian, Spanish and European parliaments, and this week is under discussion at the headquarters of the United Nations in New York....’. Story at Almería Hoy here. Sighting of the Portuguese Man O’War ‘jellyfish’ – also known as ‘the floating terror’ (Wiki) – have been seen along the Spanish coast, at least as far from the Atlantic (their normal habitat) as Altea on the Costa Blanca. There’s a site for enthusiastic Medusa watchers on Facebook here. ‘The AVE wall in Murcia begins to 'imprison' residents who live along the tracks’. The problem in Murcia regarding the route into the city for the high-speed train. Rather than an underground access, they are building a wall that’s dividing the city. The Pro Soterramiento protestors are ‘...showing photos where you can see how the wall is being left a few cms from the façades of some houses on the edge of the road’. La Crónica del Pajarito has the story here. 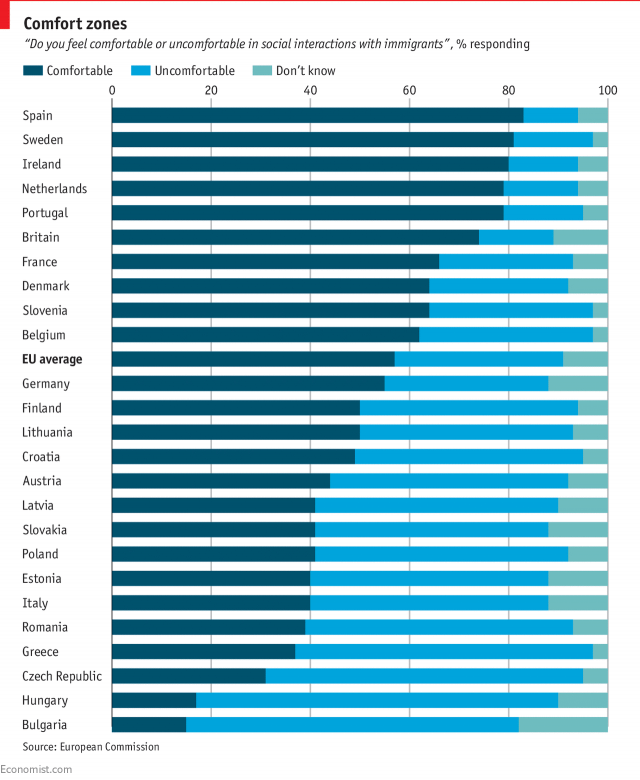 ‘Do you feel comfortable or uncomfortable in social interactions with immigrants?’ Spain has the best score in the EU here (Graphic from The Economist). For those who enjoy stories of sunken treasure: ‘"There is more gold in the Bay of Cádiz than in the Bank of Spain". It is estimated that in the Spanish seas there are 2,000 tonnes of gold and 22,000 tonnes of silver and many fishermen know where they are’. The article is at Libre Mercado here. ‘After Brexit, Spain’s Rota base will be new strategic HQ for the EU. Current operational HQ in Northwood set to change to a location that already hosts a large US naval base’. Story at El País in English here. This photo of a Galician woman as she walks around her farm reminds us of a certain orange world leader! The price of a litre of petrol is to increase in some parts of Spain (mainly the north) due to a change in the tax system. The story here. From National Geographic: ‘How Picasso’s Journey from Prodigy to Icon Revealed a Genius. Intense, provocative, disturbing, and captivating, the legendary artist led a life of restless brilliance’. An article with some great photographs here. Five wonderful places to visit which aren’t where you expect them: El País has the gallery. From Eye on Spain: Fifteen Spanish castles. ‘Due to its history, Spain has been and is a land of castles. From austere fortresses, over mountains, to true castles that look like palaces, in the centre of cities and villages, across the length and breadth of the Spanish geography, there are so many that it is difficult to choose only a few. But I am going to show you 15 of the most beautiful castles in Spain...’. Read it here. Here he is: King Africa with Paquito El Chocolatero. YouTube video.